'Why should we enable this criminal activity by volunteering our details?' asks Aakar Patel. About 15 years ago, the newspaper I was editing carried the transcript of a conversation between Salman Khan and Aishwarya Rai. This had been published also by the Hindustan Times. Its reporter J Dey (who was later murdered) had sourced it from the Mumbai police. The transcript carried a mention of Preity Zinta in a vulgar comment on her by Salman. Zinta was offended and filed a defamation case against me. The case carried on for a few years till she dropped it. However, what was interesting was that the police claimed that they had not done the phone-tapping. The voices were clearly those of the actors and so the tape was authentic. So who had tapped them? We still don't know. There are many other instances like this. Like the Tata tapes, about 20 years ago, in which the Indian Express claimed that the corporate organisation was being forced to pay extortion money to separatists in Assam. The private conversations of Nusli Wadia, Keshub Mahindra, Sam Maneckshaw and Ratan Tata were recorded and leaked. By whom? We don't know. All of these instances show that surveillance of Indian citizens by the government happens illegally without authorisation or supervision. Though these crimes became public, no official was charged with wrongdoing for the illegal surveillance. Even the scale of legal surveillance in India is very large. A recent right to information application filed by the Indian Express showed that the Union home secretary approved 10,000 phone taps a month. What is all this data being collected for? We are not told. We do not have the safeguards and checks like other democracies. In the United States, the police must show evidence to a judge who has to authorise phone tapping, and that also is done with rigid conditions. That is lacking in India. The lobbyist Niira Radia's phones were tapped for months, and then, criminally, the conversations were leaked to the press. Even if there was no suggestion of a crime, people were smeared. In India, the government can tap citizens and then deny it has done so, as in the cases mentioned above. Because of a lack of institutional process, the government has no control over the material gathered in surveillance, even if it is gathered legally (like in the Radia tapes). And there is no accountability. This is the background to the judgment by the Supreme Court on the right to privacy. I have not got an Aadhar card because I know the history of surveillance in India. Why should the government force me to hand over my biometric details to it? It is absurd. As proof of identity, I have already a passport, a driver's license, a PAN card, my landline telephone bill, my electricity bill, the documents of my house, and my voter identity card. These are all valid forms of identity issued by the government. How many other things does it want from me and why? I have received notices from Airtel and HDFC bank that my mobile phone and my bank account must be linked to Aadhar. There are horror stories of children in school being forced to get Aadhar before they are allowed to appear for exams. Aadhar has already been made compulsory for filing tax returns (I filed mine early to avoid this silly rule). 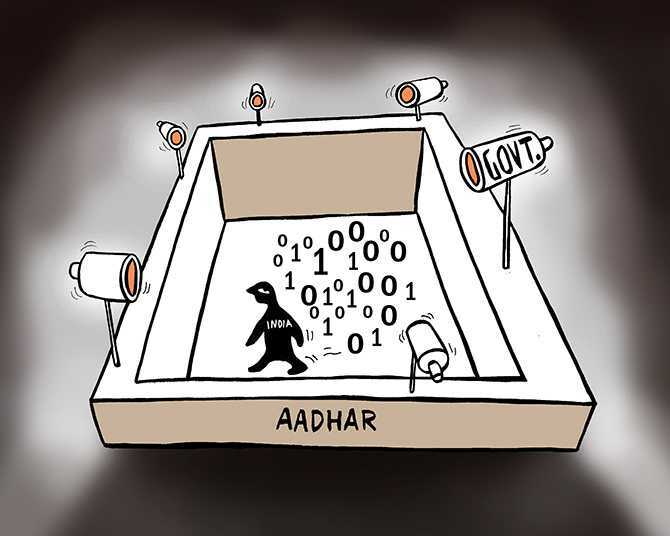 The government's supporters argue that if one has nothing to hide why resist registering under Aadhar? My answer is that I don't want to because the government's safeguards are weak. If the issue is that linking Aadhar with bank accounts and PAN numbers can catch tax thieves better, then I object. The civilised form of democracy assumes that people are innocent. Forcing everyone to link their biometric identity to their finances assumes everyone is guilty. This is unacceptable to me. On April 8, 2014, Narendra Modi was campaigning in Bangalore for the general election. He said he would scrap Aadhar after winning. From his position Modi has totally reversed himself and forcing Aadhar even on those who do not want it. Should he not explain why this reversal has happened? Of course, he will not. I met someone from an intelligence agency a few days ago. He said that there was a file on me which would have many details, much of which was gathered illegally. There must be thousands if not lakhs of such people the government is illegally spying on. Why should we enable this criminal activity by volunteering our details? We must not, and the Supreme Court judgment has given hope that this compulsory enrolment of Aadhar, linking our biometric identity to all aspects of our lives, will be stopped.